The snow has finally melted here with just a few small drifts of it straggling beside streambanks and on northfacing slopes. My garden is just beginning to show signs of life: the yellow-green tips of daffodil leaves are poking out of the ground. What a welcome sight as it is every March! In some other parts of the country, however, spring is already in full bloom. 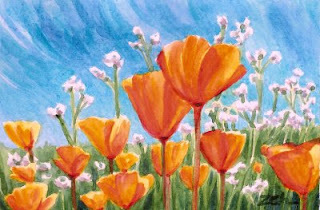 These poppies are blooming now in southern California in all their golden splendor. I tried to capture the sunlight shining through their petals in this painting.